Early in December, we realized that we still had a lot of Flex Spending money left for 2010. We had put in extra hoping that it would be there at the end of the year for TechyDad and me to get new glasses. Our wish came true, or was it a nightmare? Last time I had an eye exam, I opted to keep my glasses because I could not find anything else that I liked. Well, that isn’t entirely true. There were plenty of options out there, but I could not get them. I am allergic to one of the items in most metal frames. It makes my skin turn green and I have a bad reaction. Not good at all. Thanks to this, if I get metal frames, I have to get titanium glasses. Titanium frames are a lot more expensive. As I started to shop, I soon realized that most places did not stock titanium options because of this cost issue. On my birthday, I happened to be in JC Penney with my mother and JSL. I stopped and looked at the frames in their optical department. No titanium, but the woman was able to point me to some smaller plastic frames. I started wearing glasses in ninth grade and had never bought plastic before. I was a little hesitant, but found a pair that I really liked. 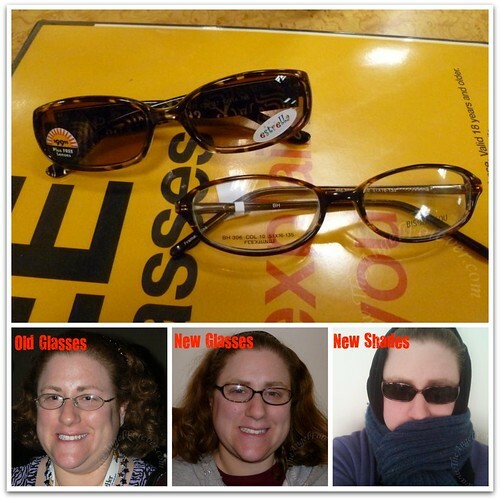 Before I knew it, I had selected a pair of glasses and new prescription sunglasses! Of course, I had to take a photo that day and explained that it was for blogging purposes. A week or so later, TechyDad went for an eye exam and picked out some new glasses to use up the rest of our 2010 money. We are both getting used to them and I am having fun with my sassy new shades. Do you wear contacts or glasses? Do you like to pick out new glasses or do you find it daunting? We bought new glasses for Hubby & the Princess w/ our leftover flex money too! I started to wear glasses in the 3rd grade & contacts in the 9th grade. I much preferred contacts because my prescription was so strong. 6 yrs ago Hubby surprised me & I got Lasik done. Best. Decision. Ever. I wear mostly glasses, but I do have contacts too. Shopping for new glasses is not one of my favorite things to do. Probably because 5 of the 6 of us wear glasses so it seems like we are always buying a new pair for one of us. I wear glasses and I love picking them out – love. I wear both but prefer my contacts when I had to wear glasses for 2 years I looked forward to a new pair to change up my look. I wear glasses, since 4th grade and used to only wear wire, but I’ve noticed plastic glasses have become extremely trendy lately and I have to admit, with the newer, prettier options available, I like them a lot. It is HARD to choose new frames though given that I can’t honestly see myself clearly when I try on a pair, I try to always bring a friend (or my husband) when shopping for a new pair. I do wear glasses, and I am dying for a new pair. Sassy shades indeed. I’m glad you found one you love. I wear glasses. My MIL once paid for contacts for me but they expired. It was hard to see with them and weird to put them in my eyes. Plus I have only one eye, so I didnt want to keep putting things in it. I had awful glasses before. I’m so glad I got to pick out some different ones last year. I’m getting used to them but wished they were smaller. My shades I have to use to fit over my prescription glasses so they are kinda over-sized. Not liking them, but they protect my eyes. Nope, had lasik done about 13 years ago. I did have the daunting task of picking out glasses. I didn’t care for it. I forgot to tell you…LOVE your new glasses! So does NY!! Those are nice looking glasses, including the sunglasses. I really like Your choices! They both look very nice on you!!! GREAT question you posed! 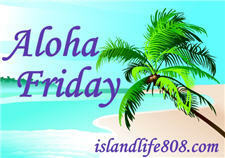 :-) Have a great weekend!! I have contacts and glasses. I like wearing my glasses just because it adds something like an accessory. I have been not wearing both because I think my eyes are getting better. I have to say, I think you look 10 years younger with your new glasses!! And I love the sunglasses! You look good in them! Tammy´s last blog post ..SmileyCookiecom You Have To See These Cookies! Adorable! I wear glasses. I’ve tried contacts but MAN do I hate those things. lol I’m actually supposed to be going to the eye doctor next month and will be getting new frames at that time. I’d SO love to get some sunglasses too, though. Love your new glasses. Good choices. I really need to get a good picture of myself with my glasses on to post on my blog.